Mary Ann Cloyd is leader of the Center for Board Governance at PricewaterhouseCoopers LLP. This post is based on a publication from PwC. The full text, including footnotes, is available here. Overseeing a company’s information technology activities is a significant challenge for directors. The pace of change in this area is rapid, the subject matter is complicated, and the highly technical language used to describe emerging technologies and evolving risks makes this a challenging area. And many companies are relying more and more on technology to get ahead, often prompting substantial changes in how they operate. All of these factors can make the board’s IT oversight responsibility appear harder than it is. Many directors grew up in a predigital age: Board members have an average age of 62, and most of their professional lives were spent in a predigital era. New technologies such as social media and cloud computing have only recently entered the scene. Very few directors have IT backgrounds: Less than 1% of Fortune 500 directors have been or are currently Chief Information Officers (CIOs). This limited experience working directly with IT can contribute to a lack of confidence in a director’s ability to oversee the strategic use of IT. Board time is at a premium: Almost 60% of directors would like their boards to devote more time in the coming year to IT oversight (an increase from only 38% last year). This is despite the fact that many directors are currently dedicating a considerable chunk of their board hours to the subject. Half of current board members spend more than 5% of their total board time discussing and considering IT risks and opportunities; one in five spend more than 11%. What can the board do to bridge the “IT confidence gap?” Structured frameworks for IT professionals and management already exist; however, they are not designed with the board’s oversight role in mind. 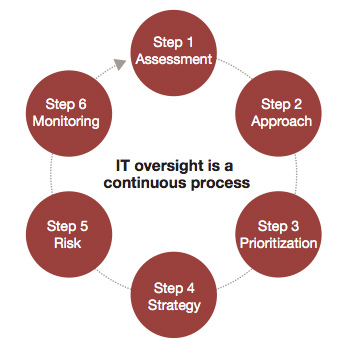 To fill this void, PwC developed the Guide, which introduces our IT Oversight Framework, to help boards figure out “what works best” to oversee IT at their companies. may help identify IT issues that may not currently be on management’s or the board’s radar. It is essential for directors to understand how important IT is to the company’s success before the board can make decisions about its proper IT oversight approach. Directors should begin by considering the role IT plays in the company’s industry and various attributes of the company, such as the current state of its IT infrastructure, budgeted IT spend, and existing and planned changes to its business model. For some companies, IT is an essential element of their business model and is often an integral part of the industry they’re in. For example, a large financial institution could not survive without the systems that process millions of transactions each day, such as deposits, cash transfers, and credit card charges and payments. For companies in other industries, IT might be less essential, used primarily for back-office support in areas such as bookkeeping and payroll. At these companies, the priority might be maintaining existing IT systems, with considerably less focus on adopting emerging technologies such as social media or cloud services. the level of IT systems integration from prior acquisitions or mergers. Many boards are already engaged in understanding the company’s IT budget: 57% are either “very” or “moderately” engaged in doing so, but more than one-third believe that their involvement is “not sufficient” or they are not engaged at all. However, the majority of boards that are not reviewing the budget consider IT to provide merely back-office infrastructure to their company. One factor to consider when reviewing the IT budget is how the company has allocated spend for IT innovation versus basic IT maintenance. Directors should understand whether the company is spending enough on IT for the future, or if it is doing just enough to “keep the lights on.” Another consideration is the ratio of IT spend to company revenue relative to others in the industry. If the company’s spend compares unfavorably to others, increased IT oversight may be necessary. regulatory requirements—IT systems built to comply with new rules or regulations. After considering these factors, directors should conclude on the importance of IT to their company. Our research reveals that nearly all directors believe they can determine the importance of IT, and more than half say IT is “very important” or “critical” to creating long-term shareholder value. When deciding on the best board approach to IT oversight, directors should evaluate whether the board or a specific committee of the board will “own” IT oversight and whether the appropriate resources are available. This decision includes considering whether to add IT expertise to the board or engage outside consultants. Bring IT experience onto the board: Boards can dedicate one or more seats to someone with an IT background, such as a current or former CIO. For companies that consider IT critical, having such a resource may be particularly important. But this approach is not favored by most board members, as only 30% of directors believe it is “very important” to add directors with technology/digital media expertise to their board. of the consultants were hired for specific projects), up from 15% in the previous year. How often should directors discuss IT? Once the board determines who will provide IT oversight, directors should decide how often to meet and discuss IT issues, as well as when to communicate with the CIO. The amount of time the board spends on IT oversight increases in line with the importance of IT to the company: Half of directors at companies where IT is “critical” and about one-quarterof those at companies where IT is “very important” dedicate more than 11% of their annual board hours to IT. Our study indicates that the majority of boards are communicating with the company’s CIO at least once or twice annually, although some (18%) are communicating at every formal board meeting. A few (14%) are not communicating at all. Now that the approach has been decided, the group charged with oversight responsibility needs to prioritize which IT areas are most relevant to the company. We have summarized the most common contemporary IT topics below to facilitate this prioritization. We have also included a few board considerations for each topic; an expanded list appears in the unabridged version of the Guide. Of course, each of these topics may not be relevant to every company. Data security—Cybersecurity is a major challenge for many companies. Successful cyberattacks can cause significant damage to a company’s business and reputation. Understand the company’s perceived level of security risk, comprehensive security strategy, and the controls designed to mitigate the risk.Determine how management tests resistance to attacks.Ask management about the company’s IT security resources and whether the security spend level is appropriate. Mobile computing—Mobile is ubiquitous and presents huge market opportunities. Devices are more affordable and provide significantly greater access to company data by employees and others. Understand the role mobile is playing in the changing global economy and evaluate the appropriateness of a mobile strategy.Understand the company’s policy for allowing employee use of personal mobile devices to access corporate data.Discuss how the company’s mobile policy is communicated to employees and how they are trained in its implementation. Data privacy—Many companies keep sensitive customer data. The efficacy of the company’s internal and external privacy policies may be critical to avoiding big problems. Understand how the company protects sensitive data from the risk of theft.Understand the company’s internal and external data privacy policies.Ask management about privacy policies related to any data exchanges with third parties. Social media—Social media is an essential tool for many companies and for their customers and employees. Directors should be aware of both rewards and risks involving how the company and its employees use social media. Take interest in how the company and its competitors use social media to engage customers, develop markets, and recruit talent.Understand whether the company knows what is being said about it on social media platforms.Discuss how employees use social media at work and what safeguards exist to protect the brand. Cloud services and software rentals—Using the Internet to access hosted computing power that can often lead to lower cost, faster implementation, more flexibility, and greater accessibility. But it is not without risk. Many companies are using, or plan to use, cloud strategies. Ask management about the pursuit of cloud strategies and cost-benefit considerations.Discuss security and privacy risks associated with using the cloud, including backupand recovery.Inquire about existing regulations and compliance risks of cloud computing. Streamlining business processes using digital means—Many companies are leveraging IT to enhance their performance. Advantages can include operating and workforce efficiencies, lower costs, and integration of supply chains and distribution channels. Companies are also finding ways to analyze large amounts of information and use it to their advantage. Ask how executives are leveraging IT to enhance communications.Understand the use of data analytics to give the company a competitive edge.Consider whether the board could benefit from the use of tablets, smartphones, or web portals. After considering various IT subjects that are part of technology today and asking the right questions, the board members responsible for IT oversight should decide which topics deserve the most attention. They should prioritize those topics for specific focus to efficiently use their time. the board’s ongoing review of the company’s strategy. The more critical IT is to the company, the deeper the board should probe the company’s plans for using technology to facilitate execution of an effective strategy. Directors at companies that consider IT critical are three times more likely to believe their IT strategy “very much” aligns with company strategy than directors at companies that consider IT to be more of a commodity. As IT becomes increasingly embedded in overall company strategy, it is more important to understand how current and emerging technologies work across the various functions within the company. Boards should discuss with management how people throughout the company are working together to understand new IT developments. This can include employees in business development, marketing, sales, public relations, and human resources. Directors should also inquire whether management has adopted an enterprisewide approach that considers the holistic needs of the entire company when making strategic IT decisions. This can help prevent a silo approach to IT strategy, which could end up being more costly and less effective. research and analyses of the timing of emerging technologies yet to hit the market. Thinking about IT as a tool for innovation can help directors close the “IT confidence gap.” Effective use of IT usually occurs if it is planned in advance with a concerted effort and focus and a well-executed plan. Considering IT as part of the company’s overall strategy also better allows the board to recognize the potential benefits of newer technologies, such as mobile computing and social media, and the impact they could have on the company’s bottom line. noncompliance with IT laws and regulations. Effective risk management entails identifying the most significant IT risks, the probability of a negative event occurring, and its potential impact. Boards should make sure that key individuals outside IT have input into the IT risk management process. These may include the Chief Risk Officer, Chief Privacy Officer, Chief Information Security Officer, business unit leaders, internal and external auditors, or even outside consultants. whether the company has, or is considering, IT cybersecurity risk insurance coverage. Companies should consider how the top IT risks can best be mitigated through effective internal controls. Risk reduction procedures are effective only if they are woven into the fabric of the entire organization. Directors should ask management whether company policies and training programs are updated to reflect the changing IT risk environment. Often, employee communications may need to be enhanced, including how to report IT policy violations or issues. Things can go wrong far too easily (and do go wrong far too frequently) for directors not to discuss crisis management as part of their risk management oversight. One aspect of crisis management planning is how the company communicates in a crisis, including how it intends to use technology. Boards should ask whether it makes sense for the company’s crisis communications plan to embrace social media as a way of reacting quickly when a negative event arises. Doing so may ensure the company’s version of the story gets heard. Our research finds only one-third of directors are more than “moderately comfortable” that their board understands the company’s social media crisis communications response plan. Board oversight should be the safety net for ensuring that a comprehensive IT program supported by the chief executive officer and senior management is followed by the company. However, the rapid pace of IT change can cause previous conclusions about the board’s approach to IT oversight to become stale quickly. Directors will want to know whether there are any changes to the company’s IT plans or new strategic initiatives and their underlying risks. Consider regular IT updates to address whether planned IT activities are being implemented effectively and in a timely manner: Directors should define how often they will receive these updates from management. The frequency of board discussions with the CIO and the amount of hours the board is spending addressing IT may also need to be readdressed based on changing facts and circumstances. negative chatter about the company in social media. The key is to initially define a process that works best for your particular board and then put the process in place. Ongoing monitoring of the effectiveness of the company’s IT activities should be supplemented by a continuous evaluation of the board’s oversight process. Not only does the business change and technology evolve, but the composition of the board and its level of IT expertise fluctuates. Periodic “fresh looks” at the framework will provide directors with confidence in their IT oversight. As technologies continue to evolve, directors will likely face more IT oversight responsibilities. Therefore, implementing a defined process for board oversight can provide distinct advantages over an ad hoc or poorly defined approach. Following an agreed-upon methodology can promote a thorough, disciplined, and rigorous board oversight process. We believe that use of the IT Oversight Framework enables directors to bridge the “IT confidence gap” and rest more comfortably knowing a robust oversight process is in place.